Located east of downtown Bartlett and just minutes from North Conway, Attitash Mountain Resort is a popular destination year round. While Bartlett had a popular CCC ski trail for many years, it was lacking a major ski area as the ski boom of the 1960s emerged. In the early 1960s, two major ski area proposals surfaced for the Rogers Crossing area just east of downtown Bartlett. 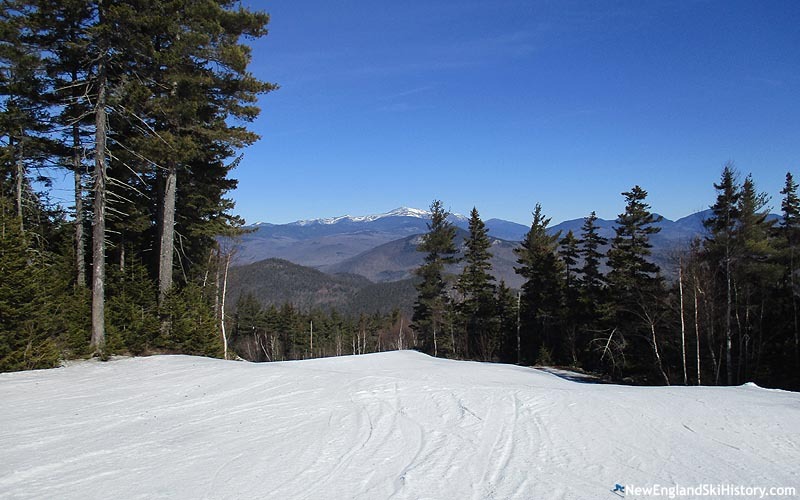 Big Bear was proposed for a peak known as Rogers Mountain, while a separate ski area was proposed for Little Attitash Mountain. The privately property based Big Bear reportedly faced issues acquiring funds, whilst Attitash reportedly faced issues in obtaining agreements to use National Forest land on its upper elevations. Earle Chandler led development of Big Bear, whilst Phil Robertson (formerly of Cranmore) managed Attitash. While trails for both areas were cut, Big Bear never saw the light of day. Some associated with the stalled Big Bear development reportedly moved over to Attitash. Work on the area continued into the winter of 1964-65, including the installation of new chairlift towers after Christmas. Reportedly named after an Abenaki Chief, Mt. Attitash opened with free skiing on January 26, 1965 with 41 acres of terrain composed of four trails and two slopes and served by a 900 vertical foot lower mountain Mueller double chairlift. Known as the "Red Carpet Ski Area," Attitash featured limited lift ticket sales and a base lodge with wall to wall red carpeting. Tapping into Robertson's Cranmore association, Attitash included similar wide trails, a Carroll Reed ski shop, and the same restaurant manager. Additional trails were cut for the sophomore season. 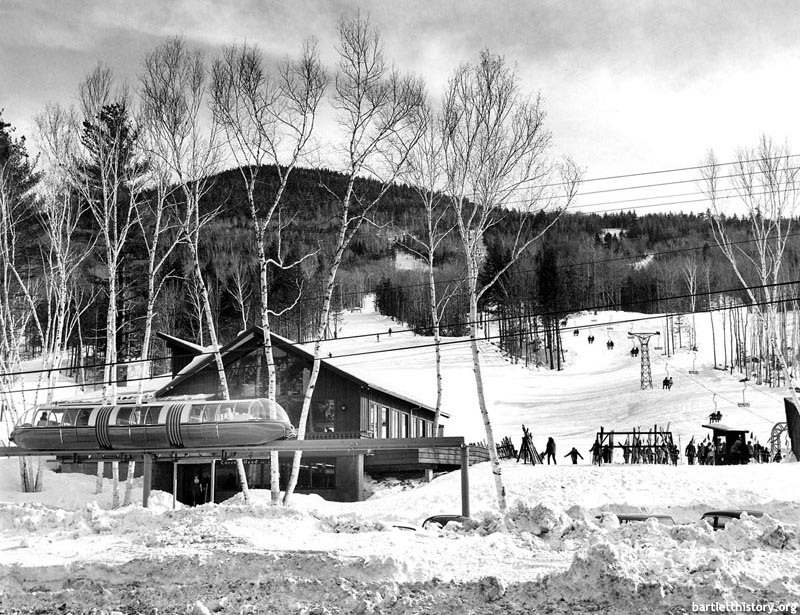 Playing into the concept of having a unique lift like Cranmore, the original build out of Attitash's upper mountain was to be served via a heated monorail. A monorail line was cleared and 1,000 feet of track installed for the 1966-67 season for testing purposes. Universal Design Limited designed the 7,600 foot proposal, which was expected to open in the summer of 1967. The monorail direction appeared increasingly less feasible when a new 5,000 foot long chairlift opened up the upper mountain in February of 1969. At this point, the monorail proposal had grown to 4 miles and was to include a sizable housing development. Plans were soon abandoned. Attitash's next sizable expansion took place for the 1973-74 season, when the previously T-Bar serviced west side of the area was improved. Twin Borvig double chairlifts were installed, about 1,100 and 2,800 feet long. Unfortunately for Attitash and other non-snowmaking areas, the winter of 1973-74 was a disaster. As a result, Attitash only operated for 47 days. Rather than hedge against bad winters with snowmaking, Attitash opted to expand off season offerings. 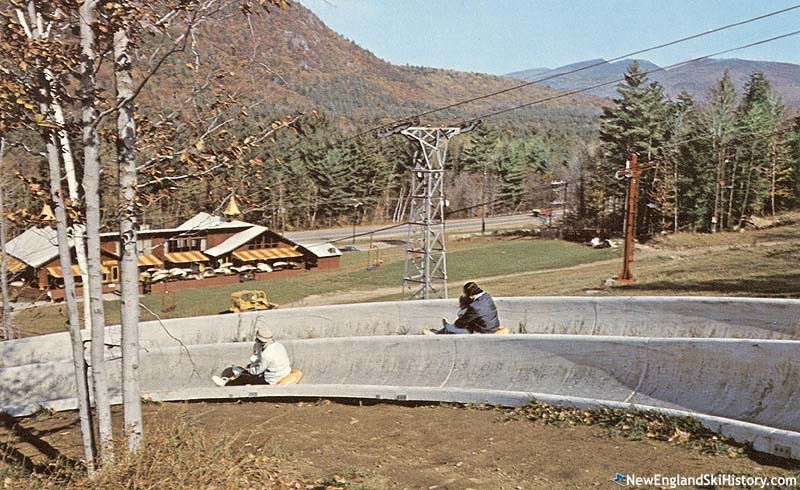 In 1976, Attitash installed the second alpine slide in New England. The half million dollar investment reportedly resulted in 200,000 tickets sold in its first season. New beginner and intermediate terrain was added for the 1977 season, increasing its inventory to 30 trails and 4 slopes. The lack of natural snow hit New England ski areas hard at the start of the 1980s, especially those without snowmaking. Attitash was limited to 8 and 32 days of operation during the 1979-80 and 1980-81 seasons. With the business in jeopardy, Attitash manager Thaddeus Thorne decided the only way to continue was to install snowmaking. After pursuing multiple sources of funding, including selling multi-year passes, Attitash became one of the last major areas in New England to install snowmaking when it built out a 110-acre system for the 1981-82 season. The $1.7 million system was installed just in time, as the 1982-83 season once again featured subpar snowfall. Attitash also ventured into the world of green energy in the early 1980s, as it installed a wind turbine atop the Top Notch Double. Three million dollars was invested in Attitash for the 1986-87 season, as the area increased its vertical again. A new CTEC triple chairlift was installed, giving Attitash a modern lift and an improved vertical drop of 1,750 feet. 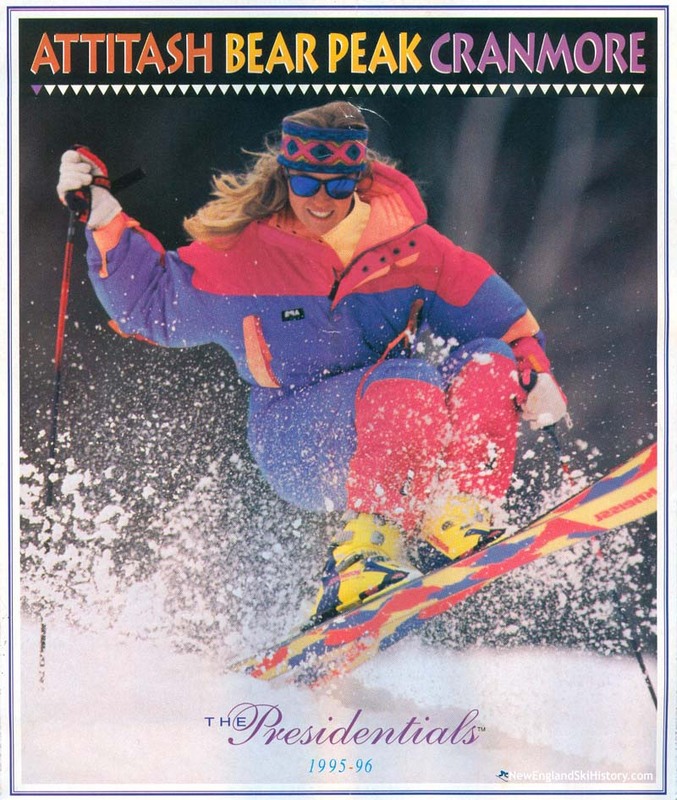 The expansion paid instant dividends, as Attitash shattered its records during the 1986-87 holiday season. Novice offerings were once again improved for the 1988-89 season, when a short CTEC triple chairlift was installed adjacent to the double-double lifts. A half million dollar investment was made in electronic ticketing circa the 1992-93 season, as turnstyles were installed to allow skiers to essentially pay per ride. With the rise of mega ski corporations, Attitash became an attractive piece in the New England resort chess game. In January of 1994, LBO Resort Enterprises and the Mt. Attitash Lift Corp. announced a purchase agreement in principal. That July, Attitash was purchased by LBO Resort Enterprises. Investments into the area began immediately. Starting that year, the never-completed Big Bear ski area was redeveloped into Bear Peak. Connecting trails were cut and the Abenaki fixed grip quad chairlift installed. Attitash was reborn as Attitash Bear Peak. Additional terrain on Bear Peak was developed for the 1995-96 season, serviced by Attitash Bear Peak's first high speed detachable quad chairlift, the Flying Bear Express. In addition, LBO Resort Enterprises acquired nearby Cranmore in June of 1995 and marketed the two areas as one. Following the 1995-96 season, Attitash Bear Peak was rolled into the American Skiing Company along with its sister LBO Resort Enterprises areas. Three new trails were added for the 1996-97 season, when the new Grand Summit Hotel was likely rolled out at the base of Bear Peak. A refurbished triple chairlift and new glades were added for the 1997-98 season. The original Old Reliable double chairlift was finally retired following the 1997-98 season. In its place, the Flying Yankee Express high speed quad was installed. Like the Bear Peak development, as well as the alpine slide, its relatively short length could be attributed to the private property boundary and thus avoidance of significant National Forest permits and lease fees. With the cracks starting to show in the American Skiing Company empire in the late 1990s, capital investment in Attitash Bear Peak quickly subsided. The resort was quietly renamed Attitash in 2004. 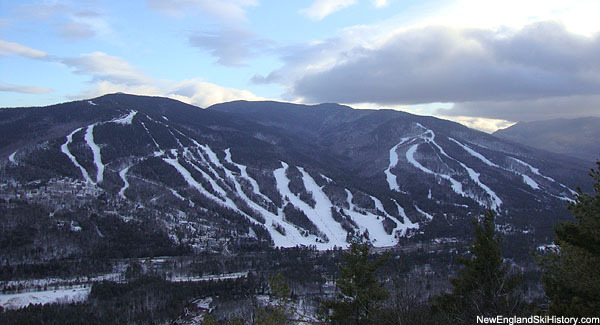 Attitash, along with Mount Snow, were the first two eastern areas sold in the 2007 American Skiing Company mass sell off. On April 5, 2007, Attitash and Mount Snow were sold to Peak Resorts for $73.5 million, plus $2 million of debt assumption. That off season, the Abenaki Quad was expanded downhill to provide access to a new real estate development. In addition, 90 new SMI fan guns were installed throughout the area, improving snowmaking. In the fall of 2010, Peak Resorts purchased nearby Wildcat and proceeded to combine the sales and marketing campaigns of the two areas. New Hampshire's second mountain coaster was installed at Attitash in 2011, giving the area a year round activity. The off season portfolio was further expanded in 2014 when two large ziplines opened. "My father, Bob Holloran, was one of the original members of the group "Bartlett Recreational Development Corp." They bought the land, and built the Alpine Village that was right where the railroad tracks crossed Rt 16, in front of the Rogers' house. Eventually, they all grouped together to form Attitash Lift Corporation, which went on to build the Attitash Ski Area. I remember when my father's group decided that they'd begin to cut some trails on what was then known as Rogers Mountain, and Wilfred Normand was hired to do the work. That would have been early '60's, and I was probably 15 years old. Wilfred had, as I recall, a Caterpillar D6 or D7 bulldozer, a Bombardier Muskeg tractor, and one horse. One weekend, while visiting the site, I somehow managed to get a ride on the Cat with Wilfred, who immediately headed up the steepest part of the trail. It was probably the most terrifying thing that I had ever done. Wilfred thought it was quite funny. By the time the two separate groups had joined together, and Robertson and Thorne had become the leaders, I was in high school and no longer had much interest in the ski area (unless they were gonna let me run the grooming machines) so I kinda drifted away. All of the men who were partners with my father have now passed on, and I haven't set foot in Bartlett for many years. I'm now nearly 70 myself, so time has indeed marched on!" "We were wondering what the history of the name was too and found this: Wilfred's Gawm (Attitash): While excavating a trail, a guy named Wilfred missed the correct route, cutting a new trail. With no way to hide it, management dubbed it Wilfred's Gawm - 'getting away with murder.' Lucky Wilfred." "My pepere was Wilfred Normand. I'm interested in finding out the story behind the ski trail named Wilfred's Gwam. I know he cut trails there. " "My dad, Albert Gagnon along with Wilfred Normand cut and cleared most(I think all) of the trails at Attitash from the beginning until his retirement. I remember working with him, 'twitching' logs on the mountain with a Belgium work horse, when I was 9 years old. Many memories and stories of Phil Robinson, Lewis Mead, Thad Thorn, and 'Chief' (who spoke French to my dad). Working with Ruth Leslie, Peter, Fran, Carla, Kurt and Tim Meade any many more... And of course learning to ski and the mountain. Attitash will always be dear to me."